Sonoma was the second last race of the season and six drivers still had a mathematical chance of winning the Drivers’ title. The results from this event would shorten the list of potential candidates vying for the championship at the finale in Fontana, California. Race morning, the area suffered a 6.1-magnitude earthquake. But the 2.385-mile, 12-turn race facility was not damaged and the event took place as scheduled. 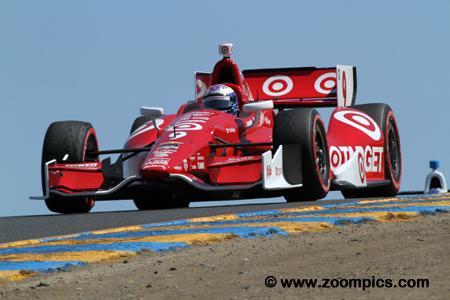 By the penultimate round, Scott Dixon was sixth in the points chase and his chances of earning the 2014 driving title were slim. Dixon started third, driving for Target Chip Ganassi but passed race leader Mike Conway on lap-83 of 85 for the victory. Conway was trying to conserve fuel but ran out just 350-yards from the finish line. 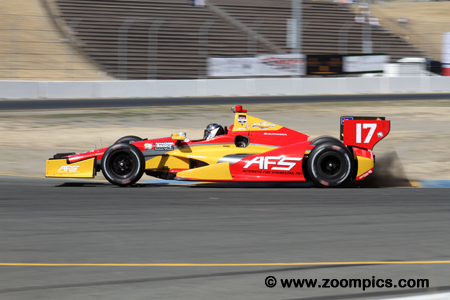 Finishing just 1.1359-seconds behind Scott Dixon was Andretti Autosport’s Ryan Hunter-Reay. 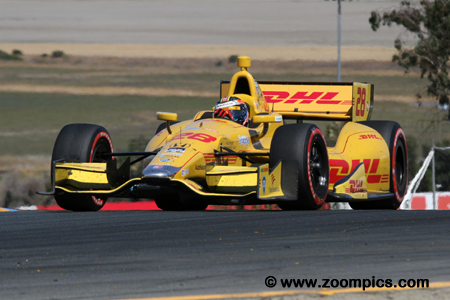 Hunter-Reay qualified tenth but benefited from Mike Conway’s fuel dilemma. The runner-up position left the 2012 series champion with an outside chance of winning his second Drivers’ title. With two races left in the 2014 season, Simon Paugneud was third in the standings. At Sonoma, Paugneud started from fifteenth on the grid. The driver of the No. 77 Schmidt Peterson Hamilton Motorsports Dallara improved twelve positions during the race and earned the final spot on the podium. This result left him with a chance of winning the championship. 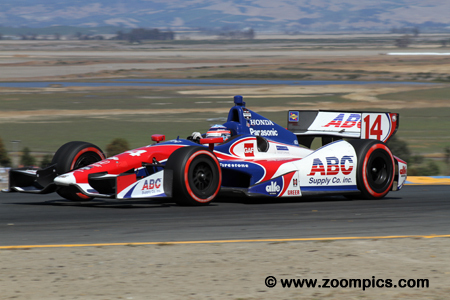 Takuma Sato started twentieth in the A.J. Foyt Racing Dallara DW12/Honda. After the morning warm-up, the team decided to change the engine and completed the task just in time for the start. 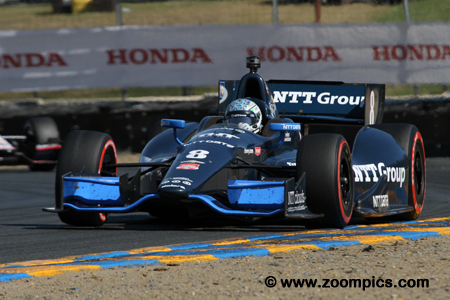 On the first lap, Sato’s car sustained damage in a turn-one melee and required new tires but he made good progress during the race and finished a season high fourth. Ryan Briscoe joined Chip Ganassi Racing for a full season in 2014. His best result to date was a fourth at Pocono. At Sonoma, Briscoe started from the fifth position but in the first-corner of the first lap, he was involved in a crash that included three other drivers. He was able to continue but was seventeenth at the checkered flag. 2014 marked Juan Pablo Montoya’s first full season back in open wheel competition after eight-years of competing in NASCAR. 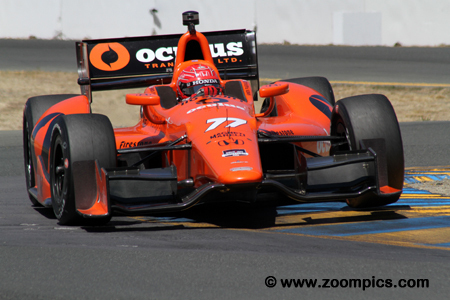 At Sonoma, Montoya started nineteenth in a field of twenty-two entrants. During the race, he moved up the order and led laps sixty-one to sixty-three. At the finish, Montoya was classified fifth. 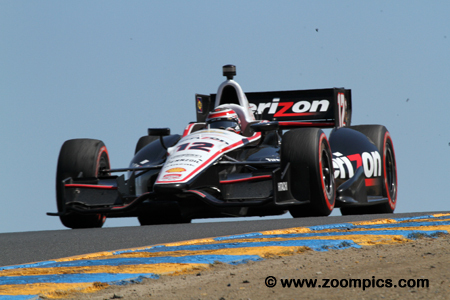 Entering Sonoma, Helio Castroneves trailed championship leader and teammate, Will Power, by thirty-nine points. After the final qualifying, Castroneves found himself gridded six. In the first corner of the first lap, he was part of a chain reaction crash that included three other drivers. 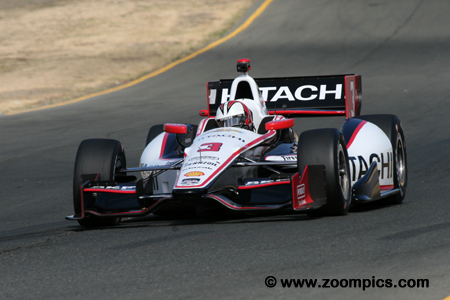 Castroneves was not able to overcome this set back and finished eighteenth. It appears that Sebastian Saavedra is about to take off after clipping the apex at turn-nine. Saavedra competing in his second full season of the IndyCar series qualified in the twenty-second position. Earlier in the season, he started first at the inaugural Grand Prix of Indianapolis. The KV/AFS driver was in sixteenth place at the checkered flag. 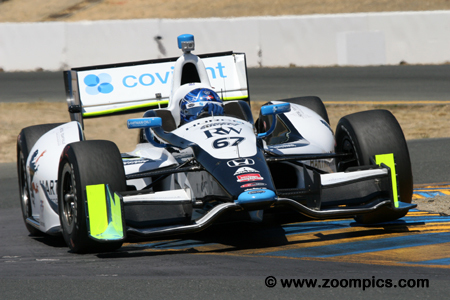 In qualifying at Sonoma, Joseph Newgarden and the Sarah Fisher Hartman Racing team found the right setup. 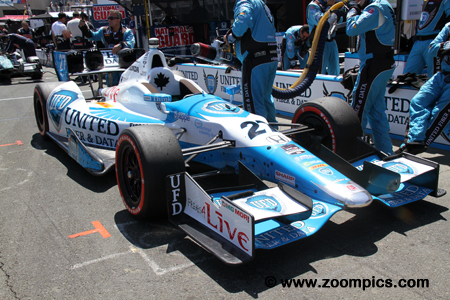 Newgarden was the quickest in the first two rounds of qualifying and finished second in the Firestone Fast 6. This was the second time in 2014 that he started on the front – the first was Mid-Ohio. During the race, he led two laps and finished sixth. Points leader, Will Power driving for Team Penske qualified on the pole. This was the fourth time in four years that Power was the fastest qualifier. He led the first thirty-three laps but spun on lap-40 which dropped him to twentieth. Power would be tenth at the checkered flag but more importantly, he increased his points lead by fifty-one over Helio Castroneves. James Hinchcliffe, driving for Andretti Autosport in a Honda powered Dallara DW12 had a solid qualifying effort and started fourth. Unfortunately, Hinchcliffe was one of the four drivers involved in the first lap crash in corner-one. From there his race went downhill and although Hinchcliffe remained on the lead lap, he finished twelfth. 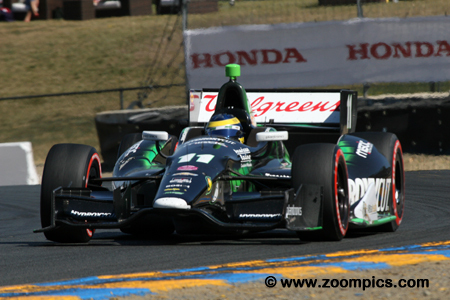 Another driver involved in the first corner incident on lap-1 was Sebastien Bourdais. 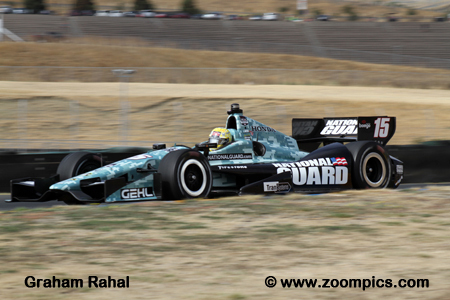 Bourdais was gridded seventh after the final qualifying session. The damage he incurred on the opening lap added to his total number of pit-stops – he visited the pits five times whereas most competitors made three-stops. He was in eleventh place at the checkered flag.